The term “buyer beware” as it turns out, applies as legitimately to the realm of “science” as it does to, say, buying a used car. There’s a tendency, in this day and age, to put scientists on a pedestal, as if they operate in a germ-free ideological environment, or are driven by objectivity alone. But this is simply not the case. The realm of science can easily be agenda-driven, especially today, motivated by politics, economics, self-promotion, a secular outlook, and oftentimes – by implication or design – their “findings” aim to threaten, challenge, and undermine the sacred tenets of the Torah. 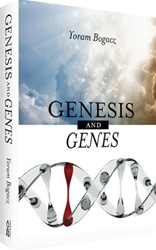 Genesis & Genes aims to set the record straight. In a balanced, informed, authoritative manner, the author respectfully puts science in its place while upholding the immutable principles of Torah and Emunah. He begins with a chapter on “how to become an informed consumer of science” and then methodically proceeds to specifically make his case – dealing with biology, cosmology, and science in general. Engaging, well written, accessible to the lay reader, and complete with detailed endnotes, references, and source material, this eye-opening text will leave readers both highly informed and highly inspired.